Mr. Nerguizian is responsible for business development, marketing and client relationship activities at DFG. In addition, he coordinates the firm’s CLO structuring and origination efforts. Prior to joining DFG in 2009, Mr. Nerguizian conducted several internships in the fields of commercial banking, wealth management, and debt capital markets, both in the United Arab Emirates and in New York, at firms such as Merrill Lynch, BNP Paribas, and Bank of Sharjah. 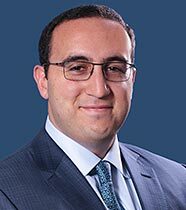 Mr. Nerguizian received a Bachelor of Science in Finance from the Carroll School of Management at Boston College in 2009 and is currently an Executive MBA candidate at Columbia Business School and London Business School (anticipated 2020 graduation).